Launched last fall, NuTowns is a master-planned community of modern townhomes located in the Pickering-Seaton area. The development by Madison Group has been a success with homebuyers for its convenient location and modern designs. The developer has just announced a new release of homes starting on April 13th. Be sure to visit the presentation centre at 2540 Brock Road at the corner of Brock and Dersan Street or call 905 391 8525 for more information. Priced from the high $400,000’s, NuTowns boasts a beautiful collection of Urban Towns. The bold exterior architecture is characterized by classic brick, precast or stone cladding, glass balconies, large windows and welcoming entry doors. Convenient rear garages create attractive and welcoming streetscapes while ensuring your car stays protected from the elements. The clean lines and contemporary style continue indoors where open-concept living spaces flow seamlessly from room to room and are filled with natural light. 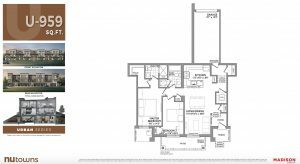 The latest release also includes the popular U-959 floorplan. The thoughtfully-designed 959-square-foot layout is nominated in the ‘Best Semi-Detached/Townhome Design’ category at this year’s BILD Awards. The suite opens to a large living and dining area with access to an outdoor patio. Overlooking the space is a functional U-shaped kitchen with ample cabinets, pantry space and a flush breakfast bar. Two generously-sized bedrooms and the main bath with a laundry closet are situated opposite the kitchen and living area. The secondary bedroom features access to the patio area through a glass sliding door, while the master bedroom sports a walk-in closet and a three-piece ensuite. Residents of NuTowns will benefit from the community’s proximity to restaurants, schools and public transportation including Durham Region Transit and the Pickering GO Station. Recreational and entertainment venues are also nearby such as the Pickering Golf Club, the Fox Run Golf Centre and Driving Range, and the Seaton Hiking Trail. There’s no shortage of shopping centres either with retailers like Farm Boy grocery, Saks Off Fifth and Hudson’s Bay all within a 10-minute radius of the community. To learn more about NuTowns, register online at NuTowns.com and be sure to drop by the presentation centre at 2540 Brock Road for this weekend’s new release. For more information, call 905 391 8525 or email ntsales@madisongroup.ca.